Jackie Chan would have you know that Shinjuku Incident is very different from all the other movies he’s made throughout his long illustrious career. In this latest movie, his character is an illegal immigrant who becomes the head of the Chinese triads in Shinjuku by shooting and killing his opponents. That’s quite the transformation especially if you consider the squeaky clean characters he has always been playing. Not to mention that he has an intimate scene too- though he reassures you cheekily that it’s not as audacious as “Lust, Caution”. But it was not an easy decision to make for the actor who’s well aware of his popular wholesome image. Meeting the press for the launch of his groundbreaking movie Shinjuku Incident, the veteran action star said that he felt conflicted even while he was shooting the movie. “On one hand, I knew I couldn’t be filming Police Story 1, 2, 3, 4, 5, 6, 7, 8 or Rush Hour 1, 2, 3 all the time. On the other, I was also aware that my films have always been family-friendly for both the young and the old so I was worried how receptive they would be to this movie.” And the dilemma was even greater, given that he was also the producer on the film. Of course, it didn’t hurt that Derek Yee was the director of the movie. 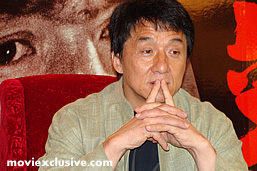 Indeed, Jackie Chan jumped at the opportunity to work with the critically acclaimed director, saying ‘yes’ even before he had seen the final script. Filming in Japan was certainly an eye-opener for the actor who admits that it was the first time that he visited Shinjuku. He recalled “the royal treatment” he received when he went to visit the area to get a feel of the place before shooting began. In order to film there, they had to get the permission of the local triads who were in charge of the area. Nevertheless, one suspects that because of the respect that Jackie Chan commanded, there were no incidents while they were filming on the streets of Shinjuku. But like Jackie Chan himself reflected, his fame has not come without a price. Indeed, listening to him talk about his career, one can’t help but empathise with the star who’s conscious of how he is perhaps a victim of his own popularity. Still, one does detect a sense of apprehension and worry that even his loyal Asian fans may not accept the new Jackie he’s presenting in this movie. In case this makeover doesn’t turn out successful, Jackie Chan has already lined up a sure-fire crowd pleaser at the end of the year. It is a movie that he reassures you is what you’ve come to love and expect from all his previous movies.